I will begin by stating that this may not be totally authentic – it is very much something I put together myself, and is not meant to be a traditional recreation of an exact dish. What made this so nice was its ease – one pot, entirely cooked in the oven, perfect for sharing across a table with friends (as, indeed, I did). The rice was beautifully savoury with a slight crisp on top, the beans and spinach adding a great backing to the overall flavour. The sweet and spicy chicken was fabulous, and the lime juice squeezed over at the end brought it all together with a sweet acidic bite. Make a marinade by blending a few teaspoons of jerk seasoning, garlic clove, half a red onion, the juice of half a lime and half a red onion. Blend it with oil until you have a smooth paste. Score your chicken thighs and smear over the marinade. Leave overnight. Preheat your oven to 200C. Chop the rest of the red onion and add to a large oven safe pot with a few teaspoons of butter, half a teaspoon of garlic paste and sprinkling of salt. Place in the oven for 10 minutes, until soft. Add half a mug of rice per portion, your tin of beans, a handful of spinach and cover with stock. Place the thighs on top and roast in the oven, covered, for 30 minutes. Use a fork to gently push the rice down without disturbing the chicken, just so the rice is still submerged. Uncover and roast for a further 15-20 minutes, until chicken is crisp. Serve with some slices of fresh lime on top for squeezing. 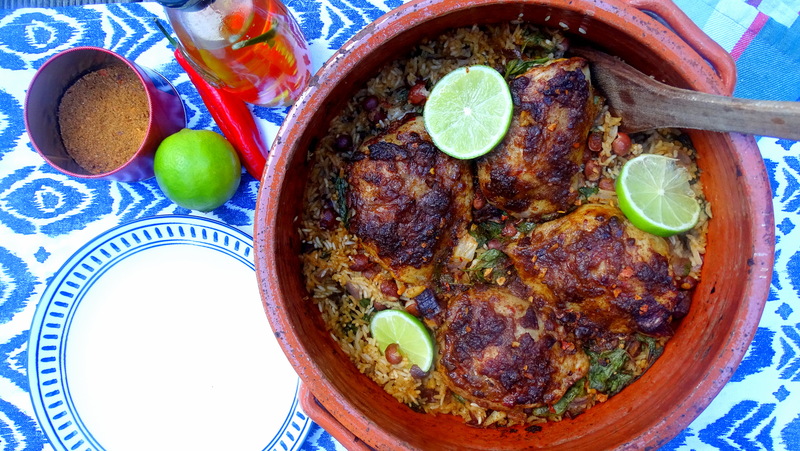 Posted in Guesscipes, Mains, One Pot, PoultryTagged beans, Caribbean, chicken, food, guesscipe, jamaica, jerk chicken, meal, one pot, protein, recipe, Rice, summerBookmark the permalink.